Once April hit, however, I felt like I was barely in the office or in this country. Firstly I was off to Girona, as written up here; then, thanks to a craftily-timed stretch of annual leave, I was off work and visiting Israel for around ten days (more on which soon, I hope!). It was an interesting holiday: Israel offers a lot in terms of history, beauty and, in Tel Aviv at least, sheer, indulgent relaxation (I also appreciate, as a destination, Israel is not without its controversies. But I’ll leave it at that). As ever when I go on holiday, I certainly felt the intense weight of my great fortune. The consequence of course is all the catching up and sorting out that returning from holiday entails, but luckily April is a quiet time at work (in some ways less hectic than the summer, which always promises to be quiet but rarely is). The quiet of April is paid for with a quickening pace in the months thereafter, and before I knew it, May was over in a flash. They’ve not been months for reflection and adherence to resolutions – I know I’ve failed on some counts over the past two months – but overall I think it’s been okay. Yes, Tel Aviv is nice (view of the sea from the Old City of Jaffa). This target was certainly not met in April – I don’t think I ate any fish while in Israel – and I barely scraped it in May, with only a single serving per week. I was hardly at work in April, as above but, apart from that, I have been doing pretty well on this resolution so far this year, and April and May were no exceptions. Although I sometimes feel less than enthusiastic about whipping something up on a Sunday evening, it usually pays dividends – especially when the weather has been as windy and changeable as it has been recently, enabling me to avoid being caught in a lunchtime downpour in search of a sandwich. I definitely achieved this goal while I was in London, but I’m a little less certain about the time spent in Israel, unless I count breakfast in the mix (which, when tallying this up, I usually don’t as breakfast is typically vegetarian for me by default). While I did eat a few meals of hummus and falafel in Israel (obvs) I also know I ate much more meat than I usually do, from spiced lamb kofta kebabs to barely-cooked chicken liver (not great). When we were at Yad Vashem (Israel’s Holocaust Remembrance Centre), a guide kindly told me to look out for some of the Belgian names in the memorial garden of the Righteous Among the Nations when we were there, which was really nice of her to mention (the Righteous Among the Nations are people who protected and saved Jewish people during the Holocaust; the most famous among them is probably Oskar Schindler, who saved over a thousand people, but the memorials also remember many of those who saved smaller numbers of people, sometimes one or two, usually by hiding them in their homes). It wasn’t a ‘celebration’ of my heritage, but provided an opportunity to reflect on European history and Belgium’s place within that, and to consider the inherent complexities associated with both the ideas of heritage and the celebration thereof – the things that are left out as well as left in. I slept pretty well while on holiday – free from stress and being forced awake for work regardless of when ready to be or not, but admittedly things haven’t been going so well since I’ve been back. More effort needed – started with going to bed at a fixed time in the evenings rather than knocking around the flat until past midnight for no fathomable reason. Obviously this wasn’t achieved, BUT I have actually planned a trip to Bath with some friends at the very end of June/start of July. I am absolutely thrilled. I’ve been doing really well on this front actually. I’ve started re-reading Agatha Christie’s Poirot mysteries, starting with The Mysterious Affair at Styles and going forward in order. They’re quick and breezy, which is a plus: perfect for the commute. I read this work by Helen McPhail about the German occupation of the north of France during the First World War (much less widely known about than the more widespread occupation of the Second World War). I also read Margaret Atwood’s The Heart Goes Last for my book group: it’s a dystopian work of speculative fiction (so far so Atwood) with an intriguing promise that ultimately tipped into the absurd and proved greatly disappointing. The significant contrast between the beginning, which chilled me deeply, and the end, which irritated me significantly, was marked. The characters were poorly drawn and their choices stretched credibility. The patchiness of this particular work is explained by the fact that it started off life as an e-book serial; it showcases Atwood at her best (the beginning) and quite possibly worst, quite unlike her seminal work The Handmaid’s Tale, which is uniformly excellent throughout. This post is also in conjunction with my friend Ariadne’s run-down of food in novels at her funny and literary blog Ariadne’s World of Awesomeness. This post relates to her discussion of Joanne Harris’ trio of food-related books: Chocolat (the most famous); Blackberry Wine, and Five Quarters of the Orange. Blackberry Wine is sort of related to Chocolat in that some of the same characters crop up, but they basically function as stand-alone novels. In all three books, food is actually a gateway for nostalgia. Blackberry Wine is narrated by a bottle of blackberry wine, and frequent references are made to how wines capture a moment, a particular year, and how drinking them can bring you back to that year. I’m not really a wine drinker and remain unconvinced, but I definitely agree that eating certain foods can transport you back to childhood, or other periods. Like cheese-and-tomato sandwiches inevitably remind me of school lunchboxes, slightly damp and crushed. As I wrote to Ariadne I planned to make blackberry cordial – recipes abound, though I was intrigued by this blackberry and orange one which I saw on Cook Yourself Thin – but the eye-watering expense of blackberries put me off the idea. Still, someone – someone with access to a blackberry bush – should try it. I loved blackberrying as a child (with my grand-dad), but the closest I got to it in London was pulling a few berries off a high bush near Holland Park. Chocolat is a lovely book. I can understand why it’s the most popular and well-known of Harris’ food trilogy. It’s about chocolate, and it has romance and mystery as well. Still, compared to Five Quarters of the Orange, I find it a little bland and lacking depth. The descriptions of food are superlative, however. 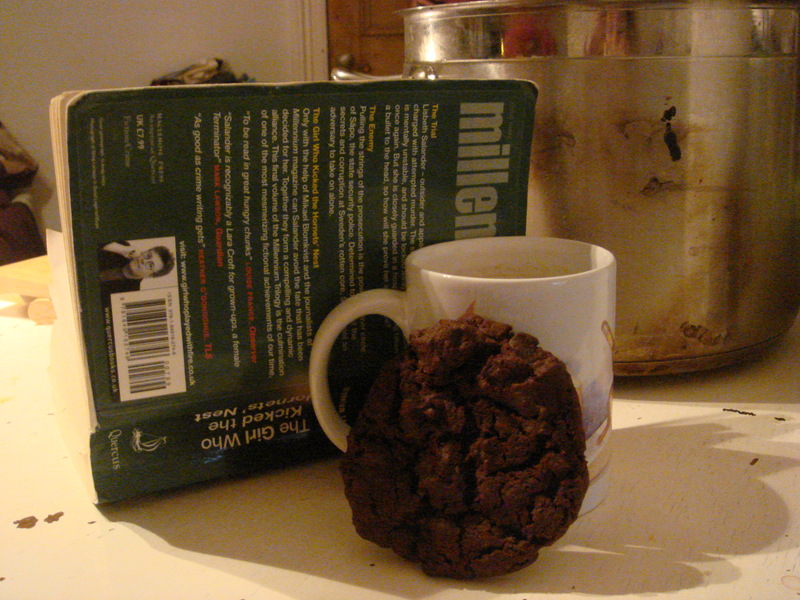 Since the whole point of the book is chocolate and its seductions, I made chocolate ginger-chunk cookies. Chocolate and ginger plays off deliciously and this recipe, based on one of Nigella Lawson’s, showcases the richness of chocolate and spicy heat of ginger to perfection. The trick is not to chop the crystallised ginger too finely. It seems a bit perverse to make something as all-American as a large, soft cookie in honour of a book which is all about France and sophisticated chocolate-eating habits, but such cookies are the perfect treat to nibble on while reading a good book (I may have eaten an entire batch of gingersnaps while reading Harry Potter book 5 as a teenager…but only maybe). 3) Mix in the vanilla and egg (on a very low setting if using an electric mixer). Sift together the flour, bicarb of soda, salt and cocoa, and stir into the mixture (I actually always sift dry ingredients straight into the mixing bowl). Mix until thoroughly combined – the mixture will be quite stiff. Stir in the ginger chunks. Five Quarters of the Orange is my favourite Harris book. Blackberry Wine and Chocolat had dark edges – in Chocolat, Harris shows that pleasure can involve pain and sacrifice, symbolised by one character’s love for chocolate and sweets despite the diabetes which is causing her to go blind. Five Quarters, though, is genuinely dark, set partly in Nazi-occupied France. The story of the occupation is told through a child’s eyes, and adult readers can imagine the pain and fear felt by the other adults, which the children are so cavalier about. Oranges are obviously an important motif in the book. They are sweet and exotic, yet the scent of oranges drives the narrator’s mother mad, a fact that she exploits mercilessly. Harris is unflinching in describing the way children, especially young teenagers, can hate their parents. She is also unsparing in describing how adults can be bitterly disappointed by the children they have brought into the world. Although I thought of dishes involving oranges, at the end of the day the book is most concerned with the simple food of rural France and particularly the Loire. Nostalgia comes in the form of preserved cherries: narrator Framboise describes the process of steeping cherries in alcohol and sugar and letting them sit for years, until they’re bled white and the stones are soft enough to bite into. “Remember that time the river ran dry?”. I made a cherry clafoutis, a French dessert involving cherries, using a recipe from Delicious magazine which was contributed by Debbie Major, a home economist who has worked regularly with Rick Stein. It was described as an untraditional clafoutis, as it involved separating the egg and beating the egg white, whereas usually the eggs are just beaten and poured into the pan, resulting in a custardy set. I thought the texture of this version was absolutely lovely, silky and tender and not too eggy. Also, you make a sauce by cooking the cherries in butter at first. I love butter, but the 50g suggested in the recipe for was far, far too much, completely overpowering the taste of the cherries and leaving an oily sheen, so I suggest halving it below. I also used frozen cherries, which were fine, and substituted sherry for the suggested kirsch. It was delicious and a beautiful dessert for company. It is a very fine, slim, elegant cake. 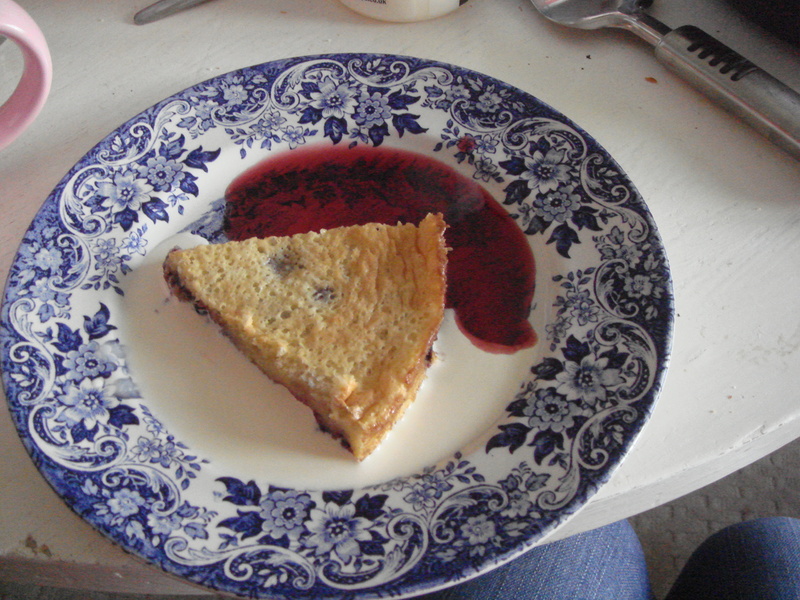 I served it swimming in the buttery cherry sauce and spoonfuls of double cream. 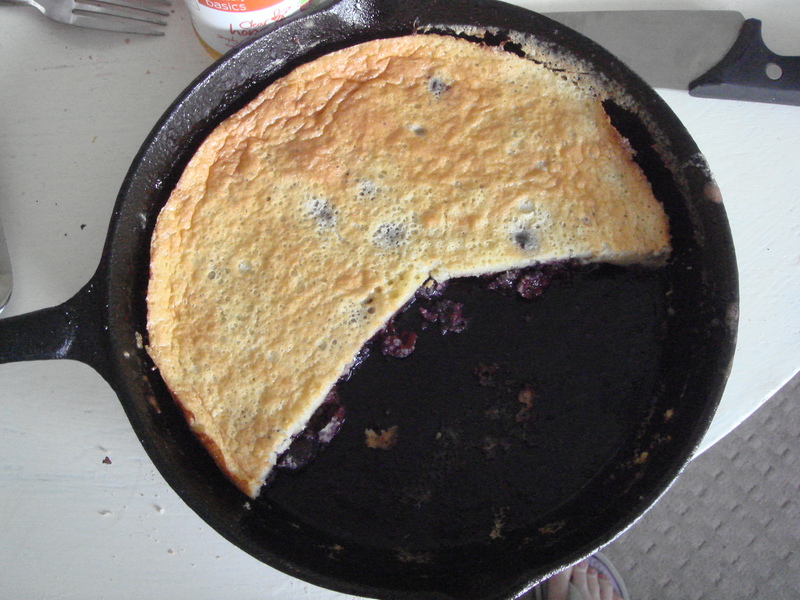 2) Melt butter in a 20cm cast-iron frying pan (mine is 25cm but needs must – it was fine) or flameproof baking dish. Add the cherries, 100g of the sugar, the lemon zest and 2 teaspoons of the sherry. Let bubble on a medium-low heat for about 15 mins, stirring occasionally. 4) Whisk together egg yolks and remaining 50g caster sugar in a small bowl for about five minutes until thick and pale (doing it by hand was fine). Stir in the cream, sift over the flour and gently stir in the ground almonds and remaining teaspoon sherry.